When my husband casually walked into the kitchen the other day, asking “What’s for dinner?”, he had such a puzzled look when I replied “Shaking Beef.” I started to explain myself, and then upon seeing him quickly lose interest, yet not gain any understanding, I stopped myself short and said “It’s a beef stir-fry.” Sometimes I need to remember that fancy names for dishes get me nowhere at home. But in order to satisfy your curiosity, I’ll share with you. This dish is Vietnamese in origin, and gets its name not from some miraculous trembling act it does on the plate, but rather from the shaking motion you use when stir-frying the beef and onions. This particular recipe is based very closely on a recipe from Charles Phan at Slanted Door restaurant, one of the many places I MUST visit whenever I might get to San Francisco. Until then, following his recipe at home will be the closest we’ll get. Good thing it’s relatively straightforward. It was also very easy to convert to gluten-free, too – all I needed was to ensure my soy sauce and fish sauce were gluten-free. (I discovered early in my gluten-free days that Three Crabs brand is not gluten-free. Now I stick with those brands that have short ingredient lists – usually no more than fish, sugar, and salt.) The soy sauce I use is San-J Low Sodium Tamari. So now that you know about Shaking Beef, and how easy it is, go forth and impress (or confuse) others with your dish! In large bowl, place meat, garlic, 1 tablepsoon agave nectar, 2 teaspoons salt, 1 teaspoon pepper, and 1 tablespoon oil. Cover with plastic wrap and refrigerate at least 2 hours and no more than 12 hours. (I actually only marinated for an hour, and it was still quite flavorful.) Whisk together rice-wine vinegar, wine, soy sauce, fish sauce, and 1 tablespoon agave nectar and set aside. In small ramekin, whisk together lime juice, remaining 1/4 teaspoon salt, and remaining 1/4 teaspoon pepper. Arrange watercress or lettuce on four plates. Divide meat into 2 portions and place in two medium bowls. In wok or large skillet over high heat, heat 2 tablespoons oil until smoking, then add one bowl of meat in one layer. Sear until brown crust forms, about 3 to 4 minutes, then flip to brown other side, another 3 to 4 minutes. Add half of red onion slices and half scallions, and sauté, stirring, until fragrant, about 30 seconds. Add 1/3 cup vinegar mixture and shake pan to release beef, stirring if necessary. Add 1 tablespoon butter, shaking pan until butter melts. Remove meat, and repeat with remaining portion of meat and remaining onions, scallions, vinegar mixture, and butter. 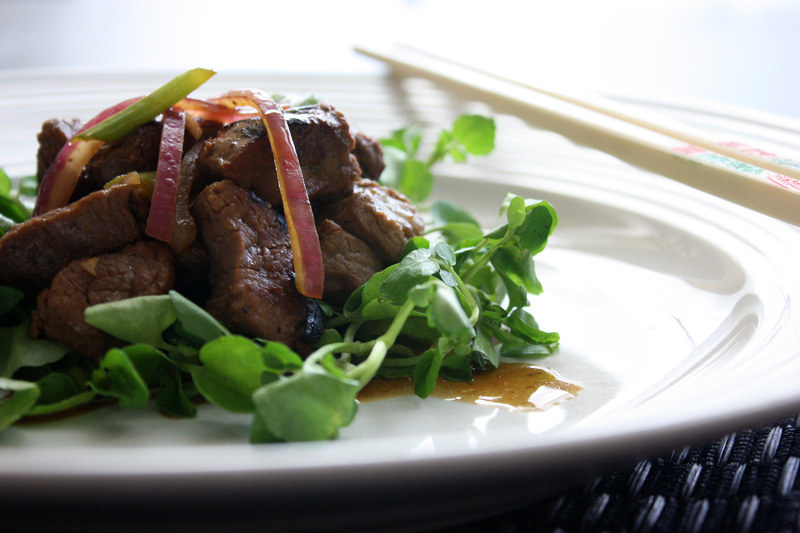 Arrange beef on top of watercress/lettuce and serve with lime dipping sauce and a side of steamed jasmine or brown rice. While we’re starting to feel the effects of spring around here, there are still some chilly, rainy, dreary days hanging around. Now is the time to squeeze in all those wintery comfort foods before it gets too warm around here to truly enjoy them. I think I need to whip up a few more soups, one last pot of chili, and get to roasting as many winter vegetables as I can, before I wake up and realize it’s too late! But first, one key “winter” dish must be executed: pot roast. I’m sure there are way too many pot roast recipes already, so I hope you’ll bear with me as I share my version. You see, as much as I can grill a steak with ease or whip up a pumpkin soup in no time, my pot roasts, in my opinion, have always left something to be desired. Too dry, too bland, too mushy…you name it, I’ve done it to a pot roast. So over the years, I’ve tweaked my techniques and recipes, making notes along the way. And now, I think I finally have it. – Some fat=flavor here. I have tried to make a pot roast with a really lean cut before, and it just wasn’t the same. Dry and uninteresting. Chuck roast is my preferred cut. I make a point to skim off the fat before I serve, both to balance flavors and to cut back the fat content in the finished dish. – Browning the meat before braising is essential. It’s an extra step, and so therefore takes some time, but the flavors are so much deeper when the meat is browned. – Remove the potatoes from the pot roast, and instead serve mashed potatoes on the side. I just dislike the mushy texture of the soggy potatoes after they’ve cooked in the pot roast all day. – Using alcohol as a flavor booster. You’ll see in this recipe that there are two kinds of alcohol. While this is not a requirement, I found that the combination of red wine and brandy added a depth to the dish that I couldn’t replicate otherwise. And with 6-8 hours in the slow cooker, I can’t imagine a smidgen of alcohol content remains. – Taking advantage of that no-fuss, hands-off kitchen appliance: the slow cooker! 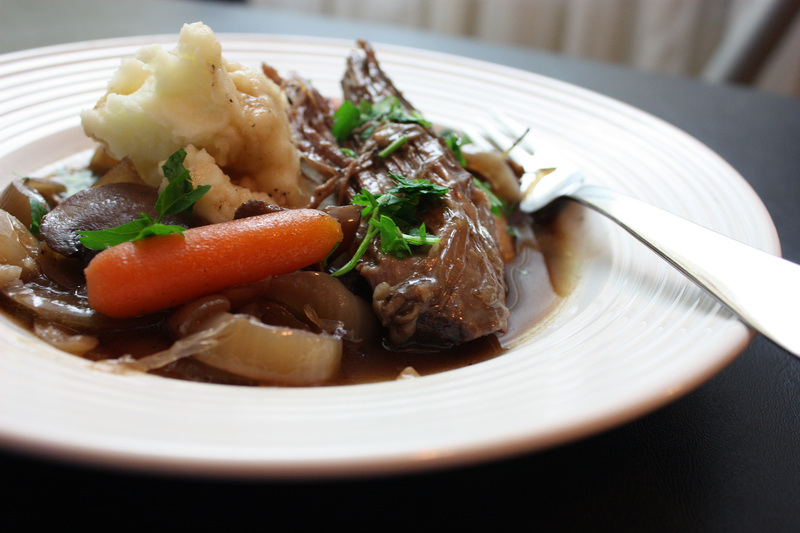 When I compared the slow cooker to using my dutch oven, the slow cooker created a more tender, moister pot roast. The added benefit of reduced energy consumption (when comparing the slow cooker to the oven) definitely helps too. So while this is a bit more involved than most of my slow cooker recipes (which are more of a “dump-and-go” routine), it’s worth it. And as with any slow cooker dish, the aroma that permeates throughout the house is wonderful. It definitely brightens any dreary, rainy day! What makes a good pot roast, in your opinion? Do you have any secret ingredients in your recipe? Have I told you before that I love Mexican food? Well, in case you didn’t hear…I love Mexican food. I could eat it every day. Around here, of course, the most abundant “Mexican” food is Tex-Mex. Gooey, cheesy enchiladas, crunchy tacos, chile con queso and lots of flour tortillas. Not that there’s anything wrong with that cuisine, but sometimes I want real Mexican food. When this craving hits, I often turn to my Diana Kennedy or Rick Bayless cookbooks. This recipe was the result of one such craving. Didn’t know what I wanted, but I started thumbing through Rick Bayless’s Mexico One Plate At A Time, and stopped at this gorditas recipe. I haven’t had a lot of opportunity to experience true gorditas (once or twice at a hole-in-the-wall place – of which I cannot remember the name – in Oak Cliff), but I knew I just had to make these. Crispy corn masa pockets, stuffed with a saucy shredded beef? What could be more wonderful than that? Of course, this is not a quick recipe. Not for the weeknights when you want something on the table in a flash. (You could, however, make the beef ahead of time, and even go so far as pan-bake the gorditas and refrigerate until you were ready to fry up the gorditas.) However, if you have the time, I highly recommend making these…they are so worth it. The meat is saucy, with just a hint of heat, very savory. I substituted Pamela’s Gluten-Free Baking & Pancake Mix for the flour, and the gorditas came out with a great, slightly chewy and crisp texture. As for the filling, feel free to experiment a bit. If you have leftover shredded pork or chicken, use that. (with a tomatillo salsa, perhaps?) I contemplated a grilled shrimp and cheese concoction, I might have to make that soon. Or you could go vegetarian, with some mushrooms, or a mix of sauteed poblanos and cheese…the possibilities are endless. If you do come up with a good idea (or two), tell me! I’d love to hear about it. In a medium saucepan over medium heat, combine the meat with 2 quarts salted water, about 1/3 of the onions and 1/2 the garlic. Simmer until meat is very tender, about 1 1/2 hours. Strain, reserving the broth for another use. When the meat is cool enough to handle, shred it into coarse strands with your fingers or two forks. Wash and dry the saucepan, set over medium heat, and add the 1 tablespoon oil. When hot, add 1/2 of the remaining onions and cook until golden, about 6 minutes, then stir in the remaining garlic and cook for another minute. Add the tomatoes, chiles, and chipotle powder and cook until most of the juice has evaporated, about 3 minutes. Stir in the meat and simmer for a few more minutes. Taste and season with salt as needed. Keep warm. Heat a heavy cast-iron or other heavy nonstick griddle over medium. Knead the masa to make it pliable, adding a little water if necessary to achieve a soft-cookie-dough consistency. Knead in the Pamela’s baking mix, baking powder, and 1/4 teaspoon salt. Divide the dough into 10 portions and roll into balls; cover with plastic to keep from drying out. Line a tortilla press with two pieces of plastic cut to fit the plates (a food storage bag works well for this). Gently press a ball of dough between the sheets of plastic to about 4 inches in diameter (about 1/4 inch thick). Peel off the top sheet of plastic, flip the gordita, uncovered side down, onto the fingers of one hand and gently peel off the second piece of plastic. In one flowing movement, roll the gordita off your hand and onto the heated skillet. Bake for 1 1/2 minutes, then flip and bake for 1 1/2 minutes on the other side. The gordita will be lightly browned and crusty on the top and bottom, but still a little uncooked on the sides. Remove and set on a plate. Repeat this process with the remaining gorditas. In the cast-iron or other deep skillet, heat 1/2 inch of oil over medium to medium-high until the oil is at about 350 degrees. One by one, fry the gorditas, turning them over after they have been in the oil about 15 seconds, and cooking them for a total of about 45 second, or until crisp but not hard. Most will have puffed up a little. Drain on paper towels. Once the are all fried, use a knife to cut a slit in the thin edge of each one about halfway around its circumference, opening a pocket. Fill each gordita with about 1/4 cup shredded meat, a little onion, grated cheese, and cilantro. Serves 10 as a snack, or 4-5 as a meal. Shepherd’s Pie is a traditional English dish, and is quite simple. It is essentially minced or ground meat topped with mashed potatoes. The term “shepherd’s pie” usually refers to the use of minced lamb, the term “cottage pie” refers to minced beef. This dish is the ultimate in comfort food, and wonderful on a cold winter’s day. My version is adopted from Gordon Ramsay’s recipe, with a few changes. I usually use beef (lamb tends to be pricey), and I use less onions. I’m also probably a bit heavy-handed with the parmesan, but I can’t help it! If you’ve had shepherd’s pie before that was bland, this one will definitely change your mind. My entire family (my husband and I, and the three kids) devoured a doubled recipe of this dish! 4. Spoon the mince into the bottom of a large ovenproof dish. Using a large spoon, layer the mashed potato generously on top of the mince, starting from the outside and working your way into the middle. Grate some extra Parmesan over and season. Fluff up the mash potato with a fork to make rough peaks. (alternatively, you can put the mash potato into a icing bag and pipe the mash into little “hershey’s kisses-shaped” mounds, which looks pretty) Bake in the oven for approximately 20 minutes, until bubbling and golden brown.